Over the past few months I’ve been investigating the best methods for batch processing images, using a variety softwares for providing outputs. My main prerequisite was that it could be used easily from the command line. So far I’ve mainly been using two, one which is a plugin to the GIMP free Photoshop alternative (Called G’Mic) and the other ImageMagick, which has similar functionality but I reckon is a little easier to use. Some of the effects are quite subtle, but I thought I’d just demonstrate how easy high quality filters can be applied from the command line using such software! Give it a go yourself! They’re both easy to use packages, and the GIMP has most of the functionality of photoshop to boot, as well as a very mature GUI! The subtly of the contrast stretch can often lead people to think that it hasn’t worked/done much. 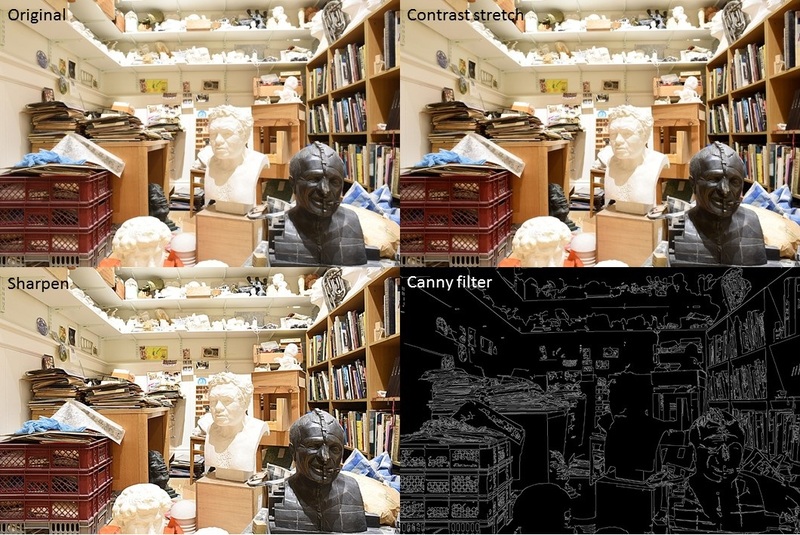 Considering this photograph, at Eduardo Paolozzi’s studio in Edinburgh, was taken with a Nikon D810 with a prime lens means that the contrast balance is already quite good. The soft lighting and lack of any atmospheric effects have parts to play in this. Hmm. It seems something’s happened but the change is quite small, a bit difficult for us to comprehend with our eyes. But with another contrast stretch on the result, voila! 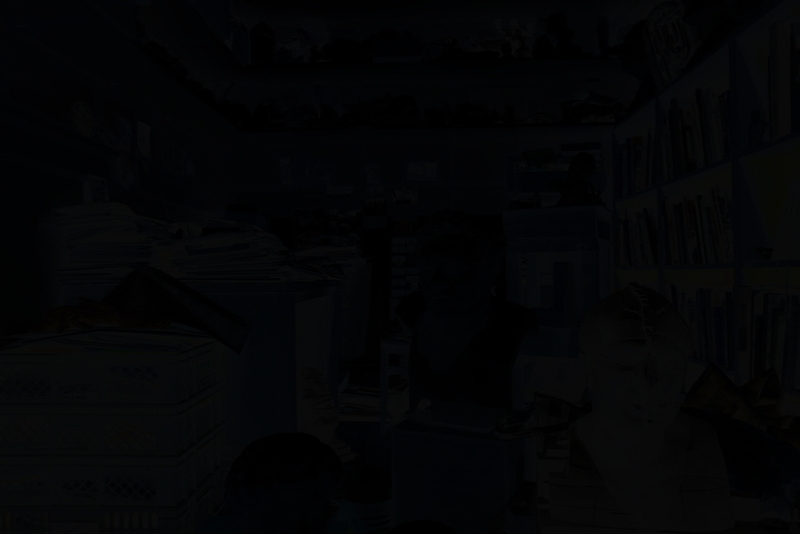 It bursts to lfie, and we can start to see on how the image has been modified. Many of the very dark areas within the image are overexposed, and have already reached the top bin of the camera, and so aren’t changed atall! 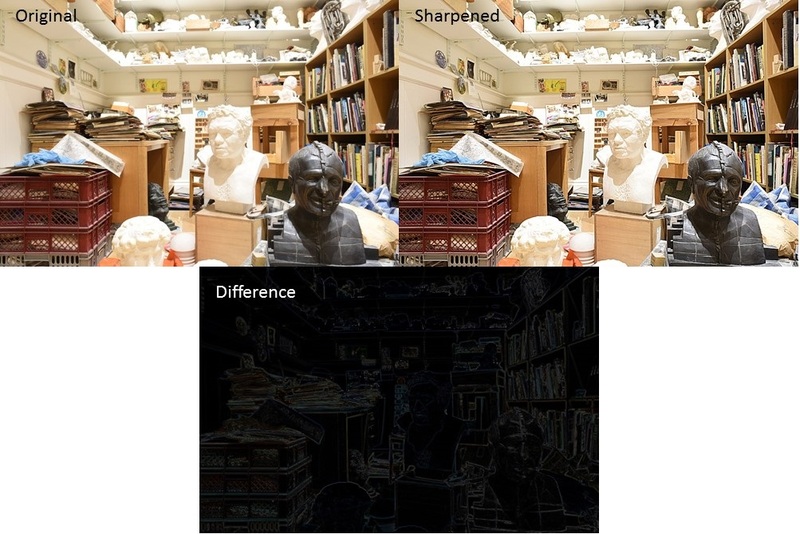 I’ll conclude by presenting the difference image for the sharpening filter, and you can think about what it’s doing yourself, then read about it in ImageMagick‘s documentation. Stay tuned for further installments where I’ll explicitly detail the inner workings of many of the filters present within these packages, and see how they might help us with photogrammetric work! I stumbled across a fantastic article by a video game studio who are using photogrammetry to make assets and insert them directly into a 3D environment. They note some critical methods and ideas to take forward when conducting a photoscan, and the models they present on webGL are really awesome! So awesome, in fact, that I’ve produced a couple of my own from data collected by my PhD supervisor from a recent trip to Argentina. Having seen this and pondering it I decided to give making an interactive environment a go this weekend, and have produced a simple example with some crude models for a project I am involved with. The results, while basic, were very easy to produce, and so It’s got me thinking about other ways of communicating geodata interactively. Watch this space!